Saskatchewan MP Erin Weir, who was under investigation following harassment complaints, has been expelled from the NDP caucus. But Weir says he is not being kicked out because of the report's findings, but for speaking to the media. 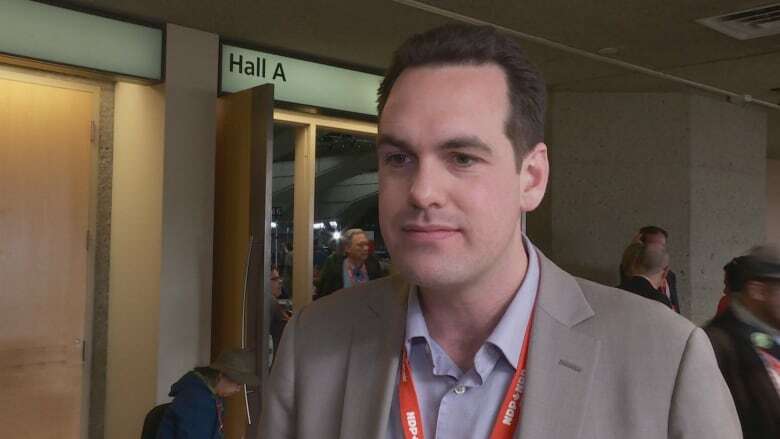 Saskatchewan MP Erin Weir, who was under investigation following harassment complaints, has been expelled from the NDP caucus by party leader Jagmeet Singh. But the reason for his expulsion is in dispute. The party says the third-party investigator found one claim of harassment and three claims of sexual harassment against him were sustained. The report, which hasn't been released publicly, defined the sexual harassment claims as acts of a sexual nature "that might reasonably be expected to cause offence," says the NDP's statement. "The report found that when Mr. Weir was told his advances were unwanted, he stopped." In his own statement, Weir said the investigator found that he probably sat or stood too close to people at social events and tried to talk to them when they didn't want to talk. "I believe that I shouldn't be trying to make anyone uncomfortable and I didn't realize that I had done anything unwelcomed, but when I had a chance to read the summary of complaints it became clear to me that sometimes I had been slow to pick up on social cues," Weir told CBC's Power & Politics in an interview airing at 5 p.m. ET. "I'm sorry about that and I resolve to be more attentive." Singh said he was willing to consider rehabilitative approaches if the Regina-Lewvan MP took full responsibility. But "yesterday in his actions, comments, [Weir] did not accept responsibility for what the inquiry found to be a fact. He attacked someone who came forward with a complaint. He also released details that could identify the individual. All of this makes it clear a rehabilitative approach is no longer possible," he told reporters on Wednesday. Weir maintains he is not being kicked out of caucus because of the report's findings, but rather for speaking out publicly. Earlier this week, CBC News reached out to Weir for comment on a story about details in the harassment report. One complainant told a reporter that Weir spoke to her in an angry and belligerent way and that she felt physically intimidated. "Singh's office provided no guidance and, when CBC put out its story that afternoon, I felt compelled to respond to the complaint that had been made public, while being careful not to name the complainant," wrote Weir in his statement issued today. Weir told the media on Tuesday the complainant is an individual he claims blocked him from speaking on a resolution on carbon pricing at the 2016 Saskatchewan NDP convention. He went on to suggest the harassment complaint was payback for his decision to engage in a debate the party leadership considered "contentious." In the earlier release, he said that "Caucus Chair Charlie Angus ... and Federal Leader Tom Mulcair ... banned (him) from Question Period for several months as punishment for having tried to raise the issue." After his Tuesday statement hit the media, Weir said, Singh's chief of staff asked him to stop commenting on the story and he complied. "Singh then notified Weir just before midnight on May 2 that he is being expelled from caucus, not because of the report's findings but because Weir commented publicly and Singh deemed that unacceptable," Weir's Thursday statement says. Weir called the investigation "deeply flawed." "Expulsion is a vastly harsher punishment than applied to many other New Democratic MPs who have, at times, commented publicly without the leader's explicit authorization," he said. Weir also used his emailed statement, which came out just minutes before the NDP's news conference today, to apologize. "Although I still do not know who these complainants are, I apologize to anyone who felt uncomfortable because I stood or sat too close or spoke with them more than they wished to talk with me," he said. Singh said he believes the party responded appropriately and fairly. Caucus member Charlie Angus said he backs up his leader. "I was very shocked that the response to a very thorough, independent investigation that was done, as far as I can tell, with real integrity, [was] that Mr. Weir claimed that these were trumped-up charges against him to stop him from debating policy," said the Timmins–James Bay NDP MP. "That, to me, was extremely unprofessional and completely out of touch with the reality of this investigation. Disrespectful." Concerns about Weir's behaviour were first raised in late January, when Weir emailed his NDP colleagues to say he wanted to be caucus chair. Quebec MP Christine Moore replied to Weir and the rest of caucus, saying he was the "last person" who should get the position. While she said she had not personally experienced any problems, she had been made aware of concerns. Two days later, Singh said the concerns raised in the email were "serious enough" to merit a third-party investigation. At the time, Weir issued a statement agreeing that any such allegations should be investigated. He was suspended from party duties during the investigation, but stayed a member of the party. Prime Minister Justin Trudeau said he's tried to send a clear message on sexual harassment during his tenure. His government has introduced Bill C-65, which would strengthen harassment regulations in federal workplaces, including Parliament Hill. "Obviously every case has its own particularities and its own circumstances and we will deal with them in appropriate measures as they come up," he told reporters on Thursday. "But the fundamental principle and rule is that any individual in their workplace, in their home across the country, should not be subject to harassment or sexual violence. "That is the rule that we have made very clear here in this Parliament and in workplaces across the country. We will continue to demonstrate and develop the processes necessary to ensure that that rule is followed." Trudeau's own party is also grappling with sexual harassment claims. Liberal MP Kent Hehr stepped down from cabinet in January after he was accused of sexual harassment over incidents alleged to have taken place during his time as an Alberta MLA. Hehr remains a member of the Liberal caucus while an independent, outside investigation continues. The Conservative Party has also launched an independent investigation into one of its former members. In January, Maclean's magazine published a report saying Conservative MP Rick Dykstra had been accused of sexual assault in 2014, an allegation he denies. According to Maclean's, Conservative Party officials allowed Dykstra to stand as a candidate in 2015 despite the allegation. Conservative Leader Andrew Scheer said he has instructed his party to launch an independent investigation of Dykstra's candidacy.